exor has been providing services to the public sector for over 14 years and is now recognised as one of the leading independent accreditation service providers to this market. PJB renew Exor accreditation yearly. 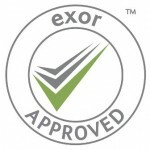 Exor accreditation standards are recognised as some of the highest in the country and only suppliers and contractors that can attain and maintain this high standard gain admission to the Exor approved supplier database. Clients that use the exor services can prove that they adopt robust compliance procedures, reduce both their risks and costs and are able to support other obligations such as supporting their local economy. Approved contractors undergo a rigorous assessment process, covering a representative sample of their work, their premises, documentation, equipment, and the competence of their key supervisory staff. Choosing an NICEIC registered electrician is the best way to ensure a safe job. Electricians registered with NICEIC are assessed on a regular basis to ensure high standards and their work is checked against the IEE Wiring Regulations BS 7671 as well as other standards. Constructionline provides an up-to-date register of pre-qualified suppliers for construction contracts. A Public-Private Partnership between Capita and the Department for Business Innovation & Skills Construction Line pre-qualify all of their registered suppliers to government standards. Health and Safety is another area of the business that PJB Solutions takes very seriously indeed, employing C2 Safety to provide audits and training. We also ask our clients what they think of us! Read what they say!